One of the questions our partners frequently ask is, “How should we promote our app?” To help you answer that question, we decided to provide you with some tips. However, there is so much information that we had to break it into two separate posts. We’ll start with tips for how to promote your app when the patrons are not at one of your events. web version of their app. This will redirect mobile users from your standard website to the mobile web version of your app. It will also detect if the mobile user is on an Apple or Android device and present them with a prompt at the top of the screen to download your app on their device. If you do have a mobile responsive site or separate mobile site, feature a notice for your mobile app on the home screen. Provide a short message highlighting what additional features they will have access to by downloading the app. Add the icon for your app to the screen. Link the icon to your app’s Smart App Download URL. Instruct the user to tap on the icon to download the app. Add mobile app download buttons to your home screen. encourage visitors to download their mobile app. Add a button for both your Apple mobile app and your Android app. Link the button to its appropriate URL. At the top where it says “Search or Redeem,” enter the name for you or your organization. “Search or Redeem” field on the InstantEncore site. Find and click on your account name to go to your InstantEncore profile. Clicking on the image for your mobile app gives you a drop-down menu with links to your Android and Apple URLs. apps in their InstantEncore profile. 3. Create a video to spotlight your app. While this may sound difficult, it really isn’t. Decide which features you want to mention and which ones you want to show in use. Write out a script for the video. Consider recruiting one of your artists to be video spokesperson for the app. Practice going through the script while interacting with your device. Get a sense of how long it takes you to go through the script. You should be able to highlight the more exciting features in a 1 to 2 minute video. At the end of your video, include the Smart App Download URL as the closing image. Upload the video to YouTube – be sure to put the Smart App Download URL in the video’s description. Post it everywhere — embed the video on your website or blog; share it on social media; link to it in email newsletters; etc. 4. Feature the app prominently in your email communications. Spotlight your app in e-newsletters, subscriber emails, pre-show emails to ticket holders, etc. 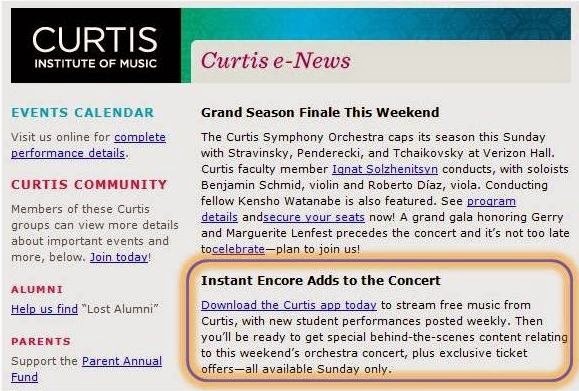 Email example from Curtis Institute of Music. Be sure to mention your mobile app in confirmation emails for online ticket sales and/or reservations. Include a brief description of your app’s features as well as a link to the Smart App Download URL. 5. Spotlight your app on the back of printed tickets and/or ticket envelopes. Include the app logo and a brief description of the app’s value. Highlight the Smart App Download URL. 6. Highlight your app on printed promotional pieces for your events and season. 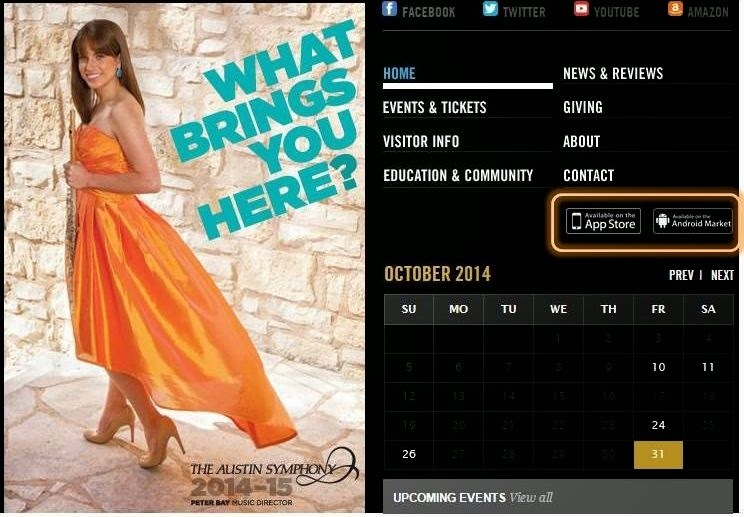 Feature your mobile app and its features in your season brochure. Mention your mobile app and its value in your event postcards, posters, and flyers. Include the app logo, the Smart App Download URL, and/or QR Code. 7. Alert your social media followers to your app. On a regular basis, post screenshots from your app to highlight new content available in your app. Include a link to the Smart App Download URL. 8. Use your App Store Description to highlight its features. It’s not enough to simply send patrons to your app’s URL on iTunes or Google Play. Once they are there, you need to communicate why they should download the app. How will downloading your app benefit them? What will they be able to do with it? Click here to learn How to Rock Your App’s Description in the App Store. In Part 2 of this blog series, we will focus on tips for encouraging app downloads when your patrons are attending your event or performance.Questions? Contact us at support@instantencore.com.